As for the revenue, the first and most obvious idea is ticket sales – that goes without saying! Apart from selling tickets, there are a lot of ways of making profit from a movie night. One of the easiest is to sell sponsorship and/or advertising on the big screen prior to screening of the movie. At the big end of town you can go and get a bank or a car manufacturer to sponsor the event for a large amount of money. At the other end of town you could get 20 small businesses like hair dressers, builders and plumbers to get an ad on the big screen for as little as $100 each. Or something in between! The big boys can provide TV commercials for screening with all the bells and whistles. Other folk may be happy to simply have their business card scanned and made into a PowerPoint slide and shown as an advertisement on the big screen. There are many low cost alternatives between the two types of productions. Promotional messages can include banners at the bottom of the screen below the white viewing area, banners along fences, handouts and posters. Any promotional message can include a line like “Sponsored by….” with the advertiser’s logos. Movie events are a great opportunity to screen promotional slides. These can be used for sponsors’ announcements, paid advertising, community announcements and of course venue announcements. A winery hosting a movie event has a great opportunity to showcase their products in front of the audience. Why not to promote wine sales and probably the restaurant and banquet facilities before the movie starts, using the giant inflatable screen? 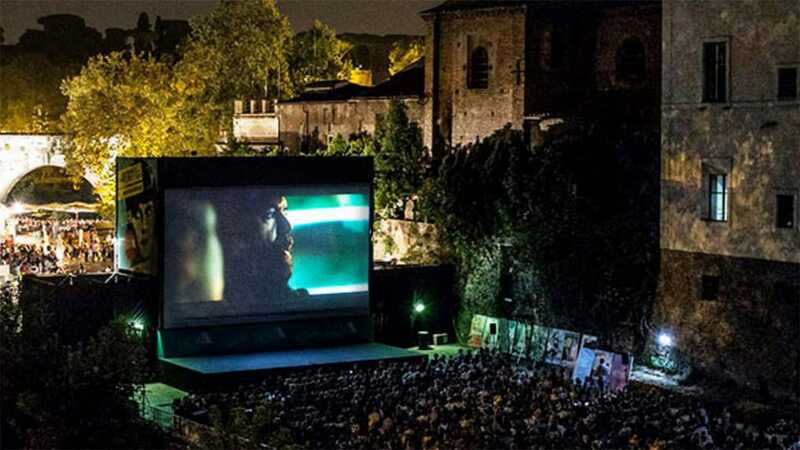 A school may use an outdoor movie event as a fundraiser. Promotional slides provide a fantastic opportunity to raise cash. Parents with a business will normally support the school where they have children. The sponsors’ slides can be sold for say $100 each and with say 20 sponsors, $2000 is instantly raised. The slides are very easy to prepare in Microsoft’s PowerPoint®. The ad may read as simply as “Sponsored by Mary’s Hairdressing” with address and phone number, and of course Mary’s logo. With an appropriate design template Mary’s ad suddenly looks very professional. When preparing the PowerPoint slide show it is important to adjust the aspect ratio. PowerPoint’s standard aspect ratio is 4:3, just like traditional TV. Most outdoor inflatable movie screens use the DVD aspect ratio or HD wide screen of 16:9. To change the aspect ratio within PowerPoint go to Design and then Page View and select 16:9. This should be done before you build the slide show so that all images and logos are formatted in the desired ratio. If the aspect ratio is selected after the show has been built the logos and images will probably look distorted. No one likes their logo being distorted. After the presentation is finished, it can be converted to a short video, using the same PowerPoint. With minimal time and money expenses, one can achieve big brand exposure – right on the big screen. Most outdoor movie events will be catered for to some degree. If the club has a bar and catering facilities you are in a great position already. Businesses like restaurants are great for contra deals and promotions. They cost both parties very little cash but offer the movie goer fantastic value. For a fundraiser, the norm is the standard barbecue supplemented by the sweets, soft drinks and ice-cream. Licensed premises will sell beer and wine. Food and beverage is a great way to raise funds. It is important to understand that sales will cease almost as soon as the movie commences. If you want to sell a lot of food, do not invite movie goers to bring their own picnic hampers. It is one or the other. Popcorn remains a huge success and a winner for all. Customers love it and they will pay incredible amounts of money for it. The cinema does very well because of the unbelievable gross profit that popcorn delivers. Apart from drink, there is nothing like it on earth. Wineries and the like will probably make available hampers with cheese and biscuits and other gourmet goodies together with their own refreshment. Wineries with a restaurant will probably promote the dinner event prior to screening the movie.